As the largest agricultural producer in the U.S., California is on the frontlines of the fight against climate change. Our state also feels the impacts of climate change acutely through increased drought, extreme weather events, and wildfires. The time to take action is more urgent than ever. In anticipation of the Global Climate Action Summit in San Francisco next week, we’ve listed (with credit to the California Climate & Agriculture Network) a few important ways sustainable farmers are doing their part to fight climate change. Many of the farms in our farmers markets, such as Frog Hollow Farm and McGinnis Ranch, are taking the lead in this fight while bringing delicious food to our tables: using organic practices, advocating for policy change, and more. It will take all hands on deck to move us toward a more hopeful climate future. These techniques will also build resilience on our farms and in our food supply as we face the challenges ahead. Conserving water use is vital to any farm, particularly in times of drought. But given that the majority of energy use on farms is from groundwater pumping (in California, it is estimated that agricultural irrigation consumes enough electricity to power 1.5 billion homes), irrigation efficiency is also key to reducing fossil fuel consumption and greenhouse gas (GHG) emissions. Water- and climate-wise farmers can use an arsenal of methods to save water—and reduce energy consumption—such as using drip irrigation, planting cover crops, dry farming, and more. Maximizing energy efficiency and shifting away from fossil fuels are important steps that farms can take to reduce their climate footprint. This can include on-farm renewable energy production such as solar panels and wind turbines, minimizing use of petroleum-based fertilizers and pesticides, and reducing dependence on fossil fuel inputs for farming, storage, and transportation of crops. Since the middle of the twentieth century, the industrialization of agriculture has led to widespread dependence on petroleum-based pesticides, herbicides, and fertilizers in conventional farming. Organic farming prohibits most synthetic inputs, which means reduced GHG emissions, as well as cleaner soil, water, and food. Furthermore, organic and sustainable techniques bring additional benefits for farmers, such as increased soil health and fertility, which leads to additional climate-friendly benefits. A major set of sustainable practices that shows great potential for mitigating and even helping to reverse the effects of climate change is carbon farming. Through photosynthesis, plants serve as carbon sinks to draw CO2 out of the atmosphere. About 40% of that carbon then gets deposited into the soil, where it feeds microorganisms like bacteria, fungi, protozoa, and nematodes. Those creatures, in return, give mineral nutrients to the plants, providing a natural fertilizer. Farms can support this process of carbon sequestration by increasing plant matter and building soil fertility through practices such as compost application, planting cover crops, and reduced or no-till cultivation. Land management practices such as reforesting rangelands, restoring riparian zones, and planting hedgerows and other perennial plants serve many benefits, such as providing shelter for wildlife, beautifying farms, and attracting beneficial insects for pollination and natural pest control. On the climate front, trees, shrubs, and other woody vegetation also store carbon in their biomass, protect the soil from erosion, and conserve water. Agriculture is responsible for more than half of California’s GHG emissions, and methane emissions from beef and dairy livestock are the primary source. Through anaerobic decomposition, manure lagoons on industrial dairy and cattle farms (concentrated animal feeding operations, or CAFOs) create harmful emissions and pollute our water supply. Holistic pasture-based livestock management through practices like rotational grazing can help to mitigate this impact, since grasses provide high-quality forage that is better for cattle’s digestion, while their hooves break up soil and manure as they move through rangelands helps to fertilize the soil. Over half of California’s land is rangeland, which holds great potential for carbon sequestration. This all contributes to soil health and microbial life, while helping perennial grasses grow and storing water in the soil. California loses at least 40,000 acres of farmland each year due to development pressures. This is bad news for not only our food supply, but also the climate, given the potential for sustainably managed farm and rangeland to sequester carbon and reduce GHG emissions. 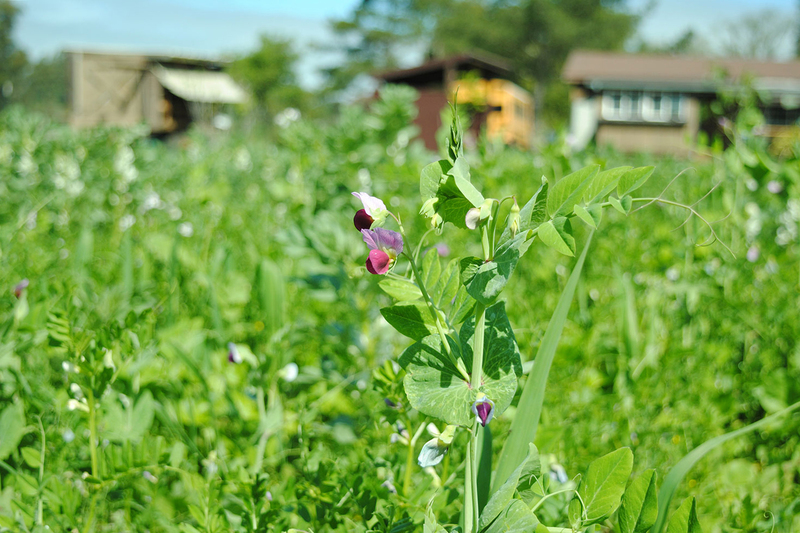 Farmland conservation also preserves local food sources, protects wildlife habitat, and promotes biodiversity, among other climate-friendly impacts. Did you know that food in the U.S. travels an average of 1,500 miles to get to your plate? All this shipping uses fossil fuels and other natural resources, and generates GHG emissions. When farmers sell directly at the farmers market or through other local distribution channels, food is transported shorter distances, conserving those resources (the average distance farms travel to the Ferry Plaza Farmers Market is about 100 miles). Supporting local farmers at the farmers market keeps farming viable, so that farmers can stay on their land and be successful growing food that sustains us while caring for the earth. There are many ways to support climate-friendly farming on the ground, but reducing the damage of climate change and building climate resilience will require major policy changes. CalCAN recently released a set of climate-friendly policy recommendations for the new California governor, including administrative, legislative, and budgetary actions to support farmland conservation, healthy soils, water stewardship, renewable energy, and other sustainable practices. As citizens, we can stand with climate-wise farmers to protect our future by urging our legislators to take action now. Join Global Climate Action Summit affiliate events starting this week, as well as the Rise for Climate, Jobs & Justice March in San Francisco tomorrow.